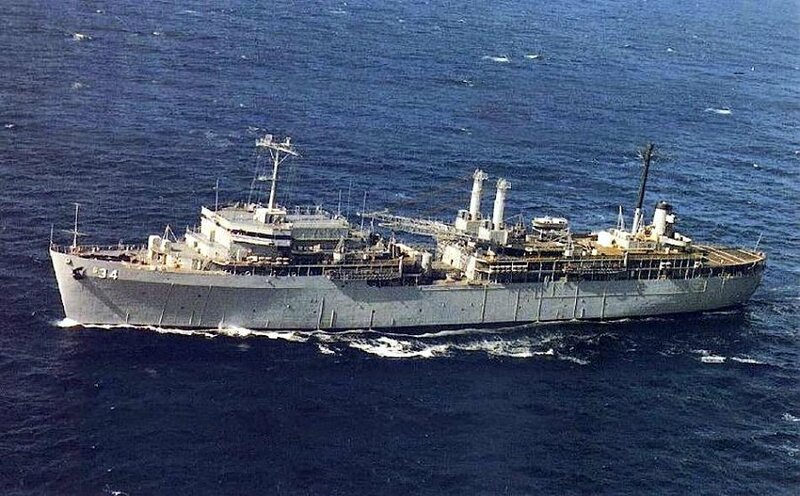 Laid down, 2 March 1964, at Ingalls Shipbuilding Corp., Pascagoula, MS.
Decommissioned, 7 October 1994 at Kings Bay, GA. 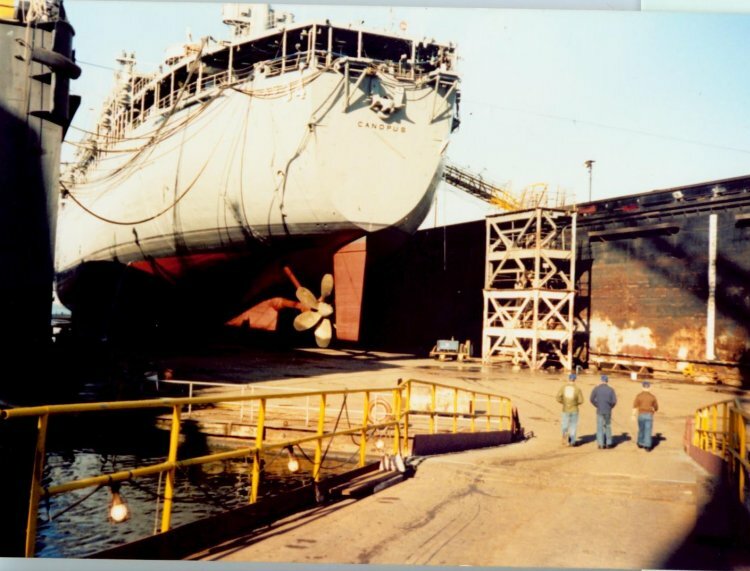 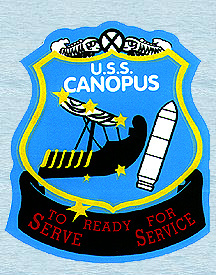 Title transfer to the Maritime Administration, 1 May 1999, for lay up in the National Defense Reserve Fleet, James River, Fort Eustis, VA.
164k Canopus (AS-34) launching, at Ingalls Shipbuilding Corp., Pascagoula, MS., 12 February 1965. 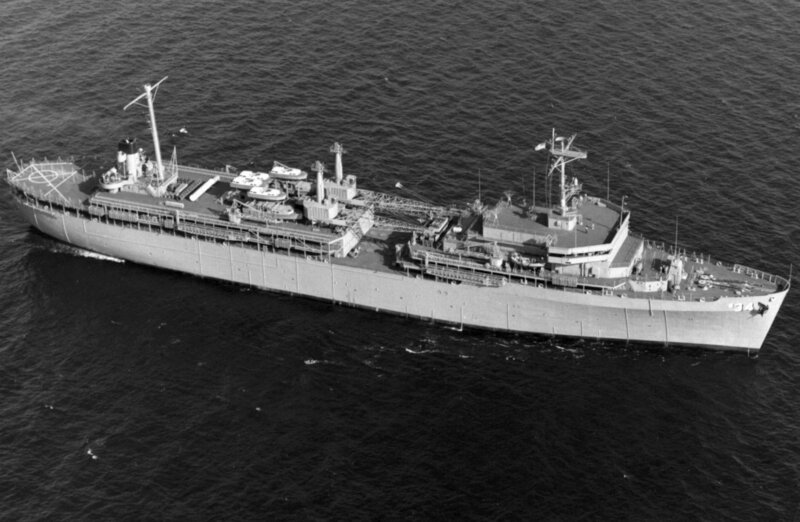 77k Overhead view of USS Canopus (AS-34) under way in 1965, location unknown. 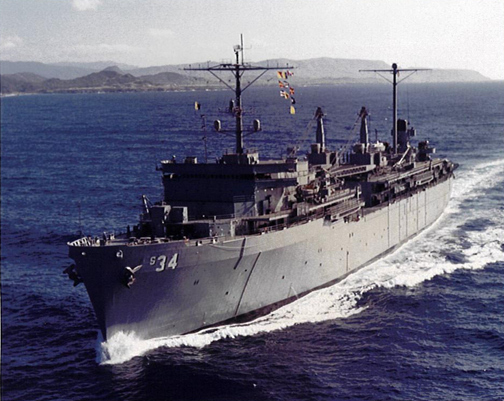 238k Aerial view of USS Canopus (AS-34) under way, date and location unknown. 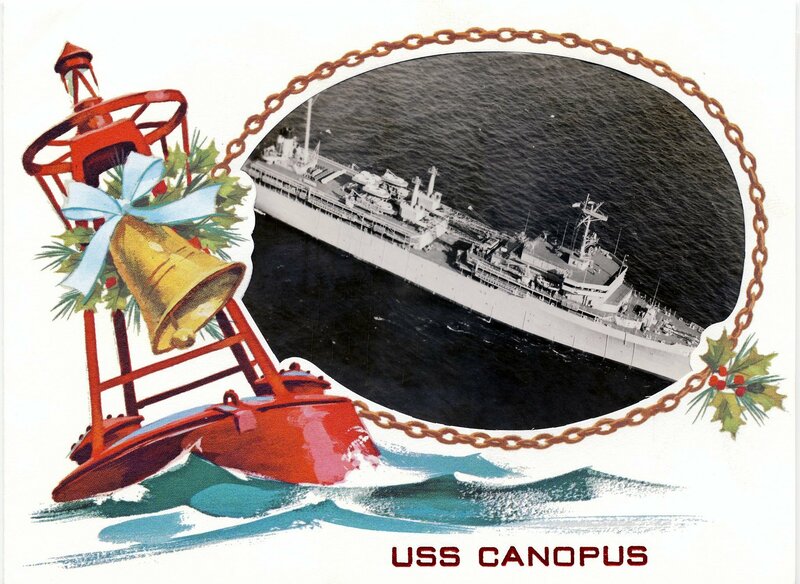 665k USS Canopus (AS-34) Christmas card, 1971. 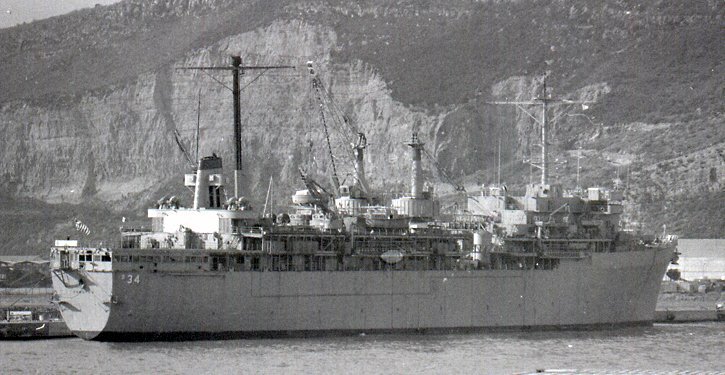 Robert "Cliff" Wolff ETC USN Ret. 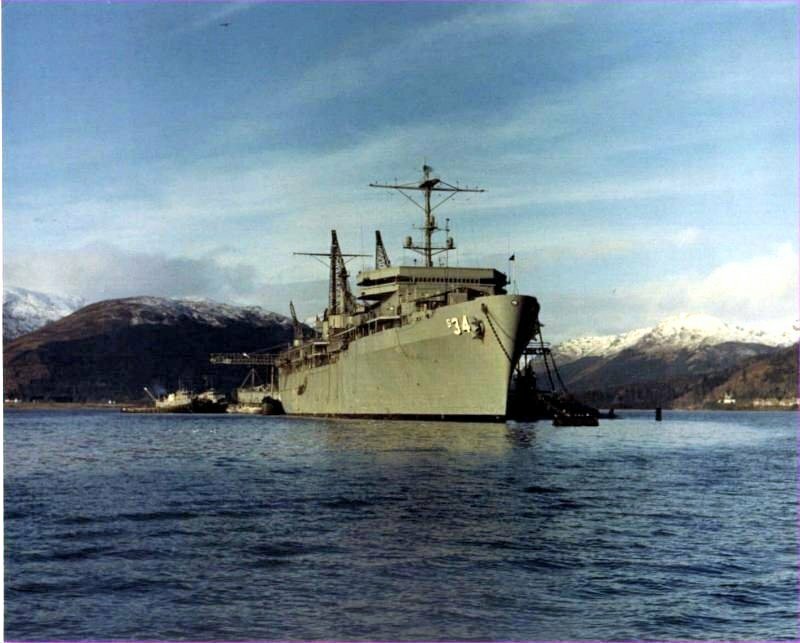 344k USS Canopus (AS-34) moored in the Holy Loch, Scotland, November 1972 Robert "Cliff" Wolff ETC USN Ret. 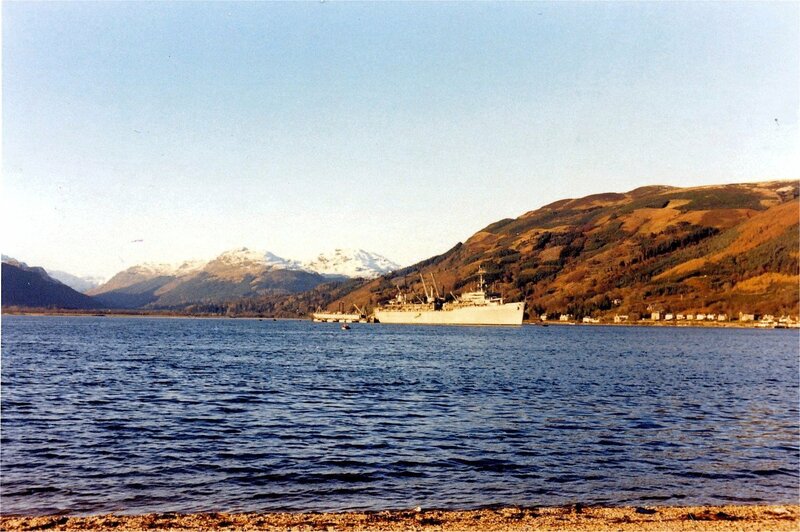 363k USS Canopus (AS-34) moored in the Holy Loch, Scotland in 1972 with a Fleet Ballistic Missile Submarine (SSBN) alongside. 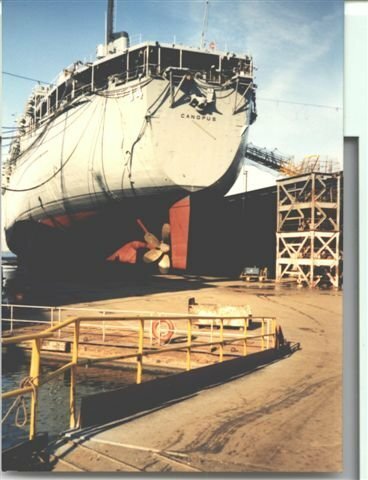 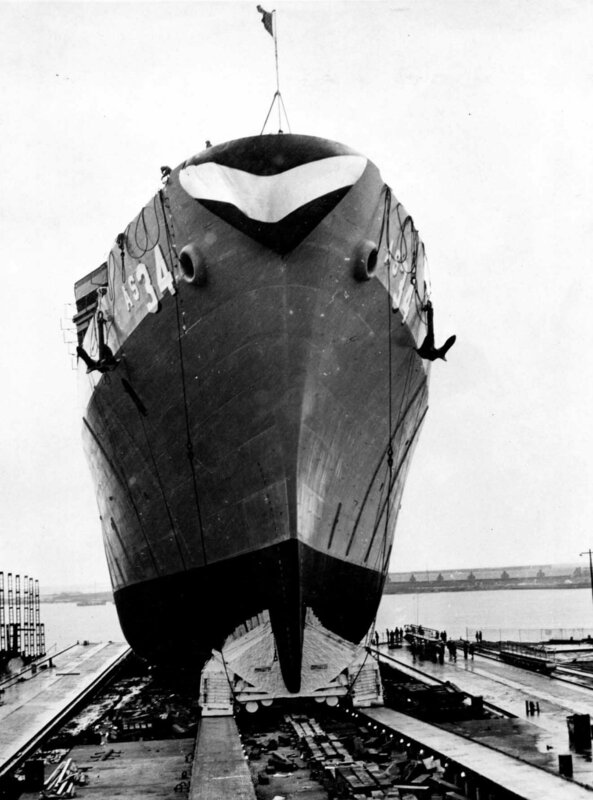 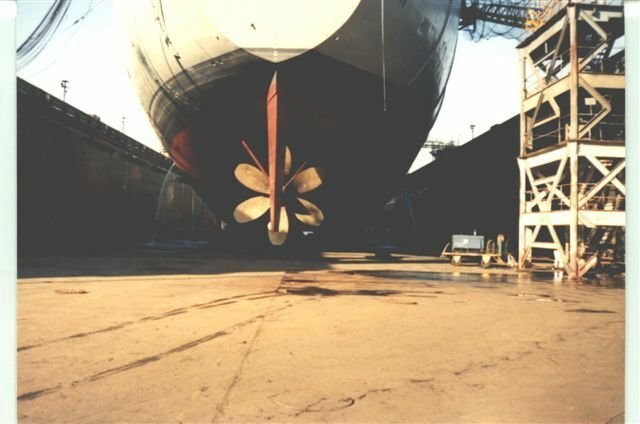 Moored aft of Canopus is the Large Auxiliary Floating Dry Dock Los Alamos (AFDB-7). 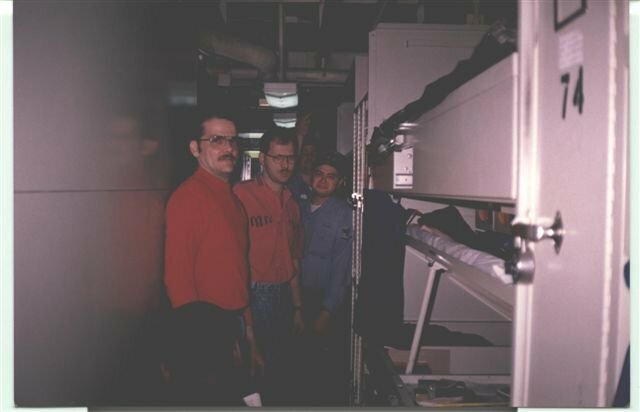 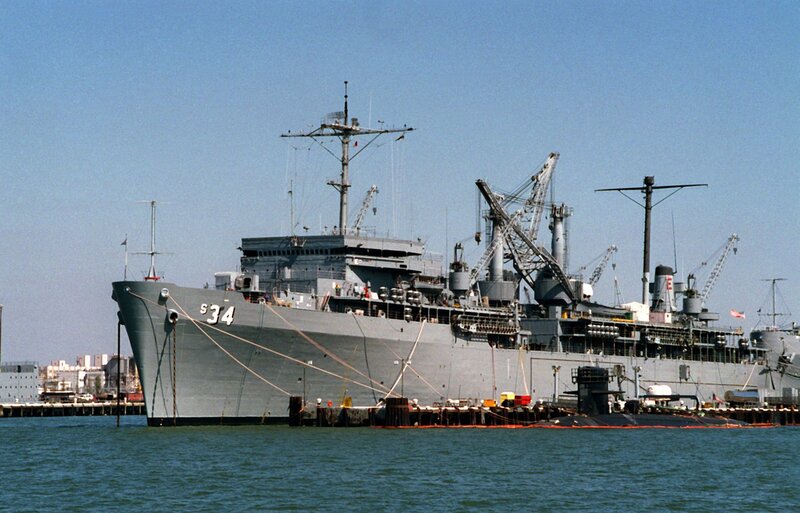 Photo by Robert "Cliff" Wolff ETC USN Ret. 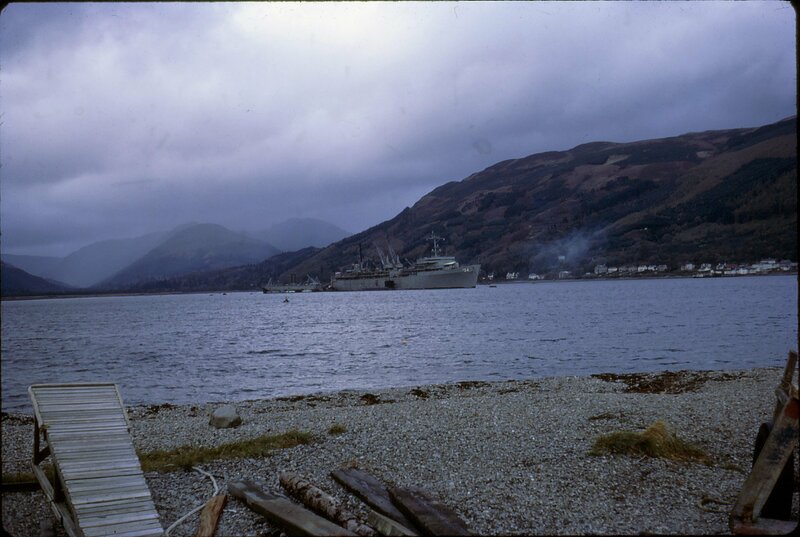 84k USS Canopus (AS-34) moored in the Holy Loch, Scotland, winter 1972 Also moored aft of Canopus is the Large Auxiliary Floating Dry Dock Los Alamos (AFDB-7),. 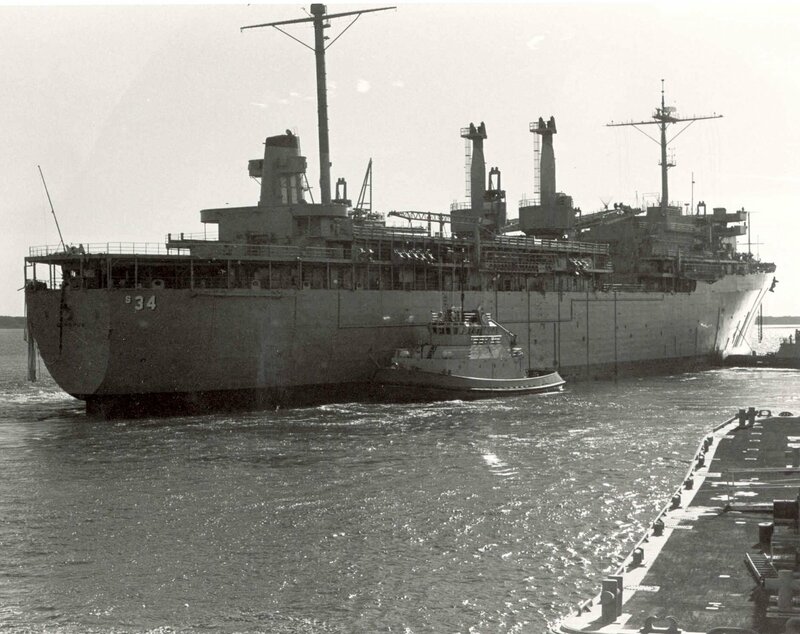 with Large Fleet Tugs alongside. 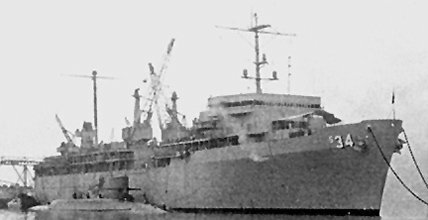 Probably, Piqua (YTB-793) and Natack (YTB-760). 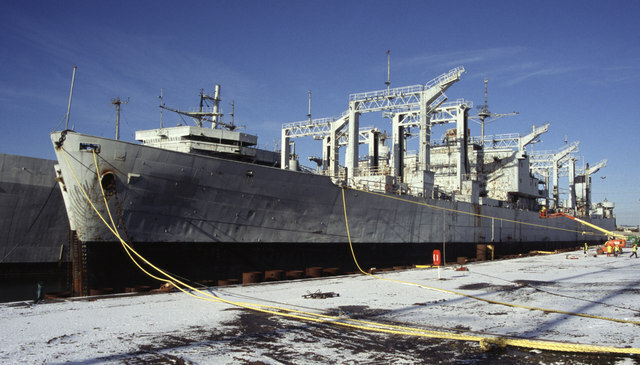 Photo by Robert "Cliff" Wolff ETC USN Ret. 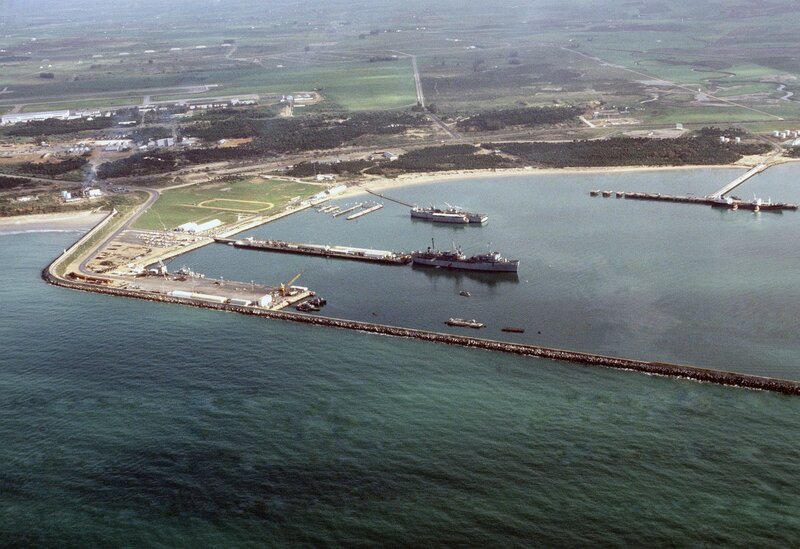 420k Aerial view of ship docking and repair facilities at Naval Station Rota, Spain, 1 March 1977, with USS Canopus (AS 34) and Medium Auxiliary Repair Dock USS Oak Ridge (ARDM-1) in their berths. 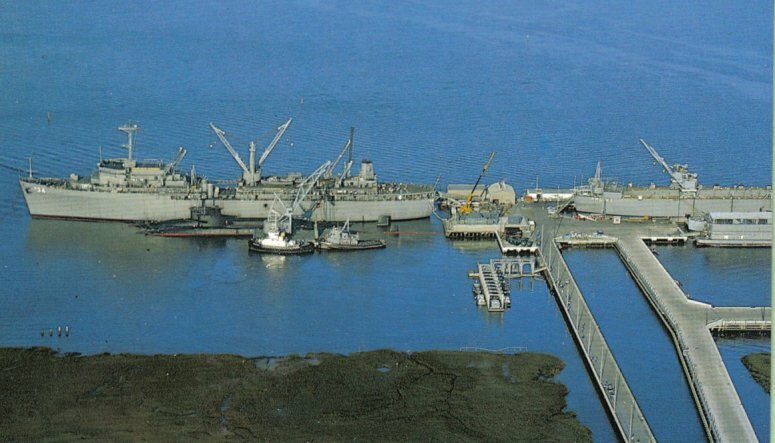 Department of Defense photo # DN-ST-87-06235. 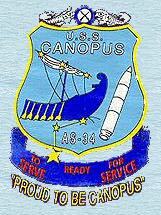 145k USS Canopus (AS-34) underway, date and location unknown. 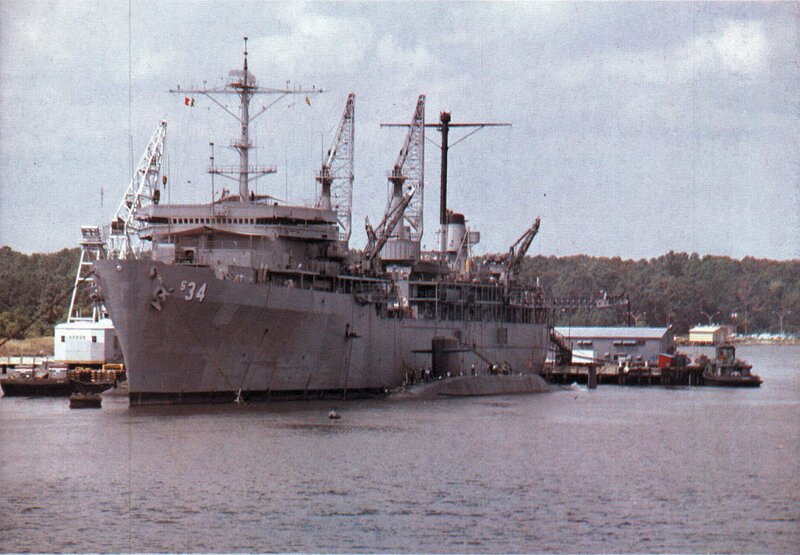 15k USS Canopus (AS-34) moored to a buoy while tending submarines, date and location unknown. 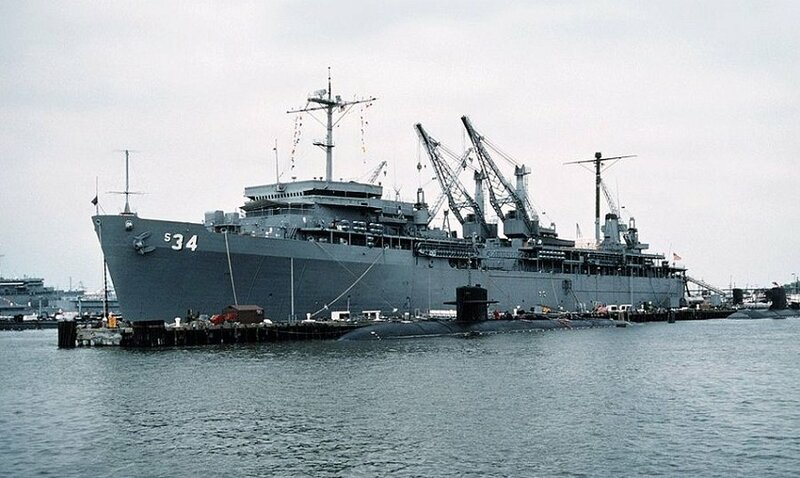 55k USS Canopus (AS-34) moored to a D&S pier at Naval Station Norfolk, VA., 1994. 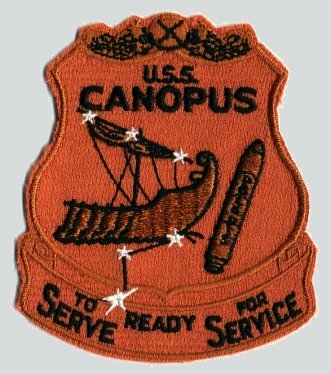 146k USS Canopus (AS-34) under way, date and location unknown. 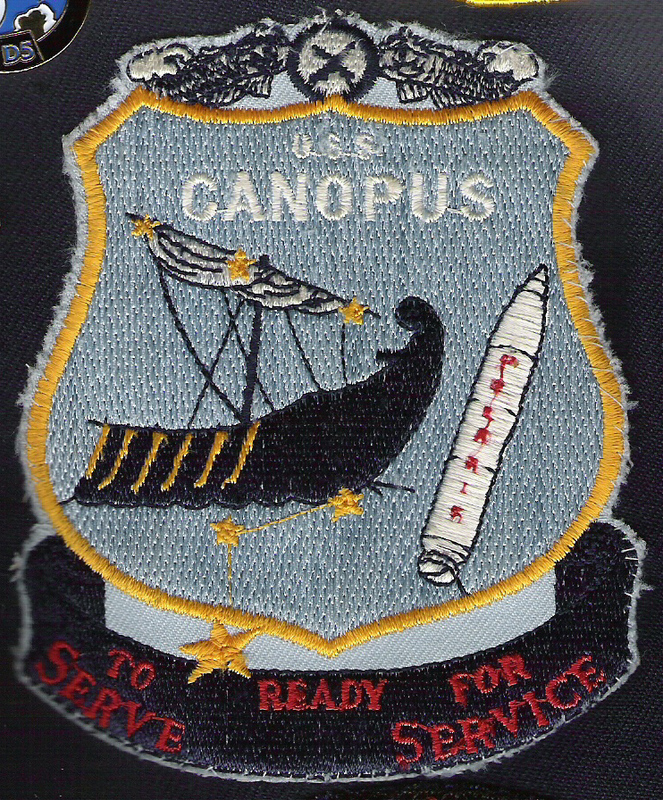 109k USS Canopus (AS-34) tending submarines, date and location unknown.